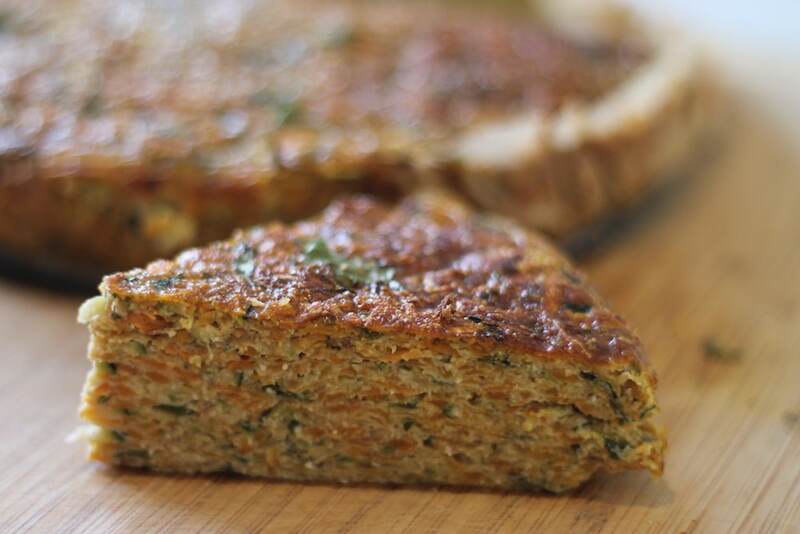 This humble slice is so easy to make and packs in loads of flavour. Every single ingredient in this recipe only serves to nourish you. Not only are sweet potatoes readily available, inexpensive and delicious, they have many health benefits. Packed with vitamins B6, C and D, thereby improving our immune system, maintaining skin’s youthful elasticity and helping build stronger bones. Thanks to their magnesium levels, sweet potatoes are great in aiding relaxation and reducing stress. They are also an amazing pre-biotic food that your good bacteria in the gut will love. Share the post "SWEET POTATO SAVOURY SLICE"
Allergy information: DF, WF, GF. Preheat oven to 180C. Line a medium sized spring form cake tin and set aside. Grate the vegetables, mince the garlic and chop the fresh herbs into a large bowl. Add all remaining ingredients into the same bowl and mix well. Season to taste. Tip contents of the bowl into the cake tin and bake in the oven for approximately 1 hour or until the centre of the bake is firm to the touch. Allow to cool in the tin for 5 minutes before sliding out the slice onto a serving dish. This recipe was created by my gorgeous and very talented friend Angie Cohen from Love Life & Gluten Free.